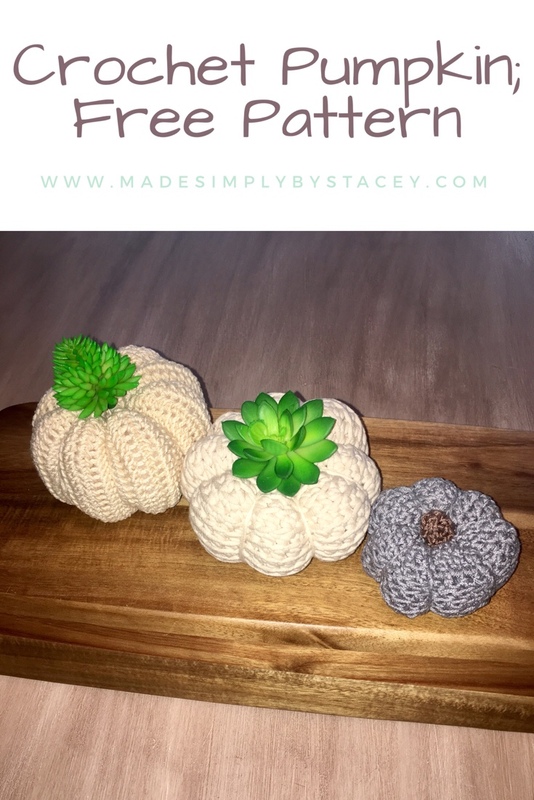 An easy crochet pumpkin just in time for fall, although I think pumpkins are cute any time of the year. I made three pumpkins in three different ways. My favorite is this pattern. Increase – half double crochet 2 times in the same stitch. Decrease Half Double Crochet (hdc2tog) – yo, insert hook into next stitch, yo, pull up a loop, yo, insert hook into the next stitch, yo, pull up a loop, yo, pull through all 5 loops on hook. Yarn; I used Bernat Maker Home Dec Yarn (5 bulky chunky) for this project. The other two I used Lyon Brand 24/7 Cotton (I love the way the 24/7 cotton Lyon Brand looked but the stitches are so easy to see with the Bernat in the pictures). Use any yarn, it’s your pumpkin and the outcome size doesn’t matter. Pumpkins come in all sizes. I used even rounds, 7 rounds increased, 7 rounds in the middle, and 7 rounds decreased, this pattern is easy to adjust. Hook – I used 4.5mm, this is a little smaller than the recommended hook, use what feels comfortable. Be a rule breaker. Crochet in the back loops, this will make a ribbed look. Half double crochet (hdc) 6 stitches in the center of the circle, sl st in the first stitch to join. Pull tail to tighten. Work 2 half double crochets in each stitch. At the end of the round, you should have 12 stitches. Join the round with a slip stitch. *1 hdc in the next 3 stitches, 2 hdc in the next stitch (1 stitch increased); repeat from * to end of the round, slip stitch to join. You will finish with 30 total stitches. *1 hdc in the next 4 stitches, 2 hdc in the next stitch (1 stitch increased); repeat from * to end of the round, slip stitch to join. You will finish with 36 total stitches. *1 hdc in the next 5 stitches, 2 hdc in the next stitch (1 stitch increased); repeat from * to end of the round, slip stitch to join. You will finish with 42 total stitches. This round will end the increase, this will make your project bowl to form the sides of the pumpkins. We will work 42 hdc in the 42 stitches in the round. *1 hdc in the next 5 stitches, hdc2tog (1 stitch decreased); repeat from * to end of the round, slip stitch to join. You will finish with 36 stitches. *1 hdc in the next 4 stitches, hdc2tog (1 stitch decreased); repeat from * to end of the round, slip stitch to join. You will finish with 30 stitches. *1 hdc in the next 3 stitches, hdc2tog (1 stitch decreased); repeat from * to end of the round, slip stitch to join. You will finish with 24 stitches. *1 hdc in the next 2 stitches, hdc2tog (1 stitch decreased); repeat from * to end of the round, slip stitch to join. You will finish with 18 stitches. *1 hdc in the next stitch, hdc2tog (1 stitch decreased); repeat from * to end of the round, slip stitch to join. You will finish with 12 stitches. *hdc2tog (1 stitch decreased); repeat from * to end of the round, slip stitch to join. You will finish with 6 stitches. Pull through a long tail to fasten off. You will need enough to wrap around the pumpkin several times so be generous. Using a tapestry needle thread the tail. Wrap the tail around the pumpkin halfway, at the bottom insert the needle through the center of the pumpkin. Do that 8 times, to give the pumpkin the indentions that pumpkins have. Pull yarn tight (this will also flatten the top and bottom a little. Fasten off and insert an artificial succulent in the top. Ta-da super cute crochet pumpkin. Do you love pumpkins but you don’t crochet. Check out this list of my favorite DIY Pumpkins.